Brad Hoshaw at The Shark Club, March 19, 2016. The Shark Club, located at 2808 S 72nd St, felt like the kind of place that was a hip, happenin’ hot-bed of late-night action… about 20 years ago. A loud crack! brought me back to reality, and a young ponytailed girl walked through the hall with a 3-stack of billiard-ball racks. I almost bumped into a guy eating french fries staring at a table while Fast Eddie Felson grimaced watching his cue ball drop in the corner pocket. Back in the bar, Brad Hoshaw tested his microphone, surrounded by high-top tables, flat-panel TVs and 100-gallon fish tanks glowing with coral. His stage was a plywood platform backed by a huge 10-foot by 30-foot mirror. The lighting was weird. Hoshaw looked like an alien covered in odd patterns of cheap green-red-blue digital lights. But after 10 minutes of futzing around, the sound wasn’t half-bad and Hoshaw began rolling through another high-quality solo acoustic set. 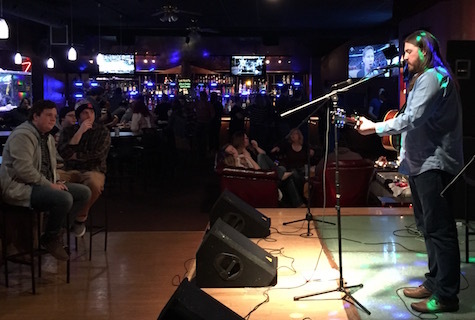 He’s one of the few local performers who can entertain a room with just his voice and his guitar, thanks to the strength of his songwriting (first-tier all the way; like I said, if I only owned a label…). The 30 or so on hand paid attention in a room not designed for live music. Three folks sat in a large out-of-place red-leather bolstered couch in front of a dormant fireplace that had a large TV mounted over it that showed a courtroom documentary instead if the NCAA tournament which was wall-to-wall in the other room. A group of folks next to the front door erupted in laughter. A family reunion. Hugs all around. Meanwhile, behind where I’m sat, plates of hot wings and nachos cooled untouched in the kitchen’s pickup window. A bell chimed for someone to fetch the victuals, but no one showed. And so it went, a very different scene from 20 years ago, before cell phones and Tinder, back when a bar like The Shark Club got its name not because of the fish tanks but because of the action happening on the dance floor. Technology has made meat markets obsolete, turning them into pseudo sports bars, pool halls and now, music venues… sort of. Lots o’ stuff happening this week. Two shows of note tonight alone. Lookout Lounge does it again, this time bringing in SWMRS for a headlining show. The Oakland-based punk band features the son of Green Day front man Billie Joe Armstrong (Joey Armstrong) on drums — don’t hold it against them. From what I’ve heard online, they blow Green Day out of the water. Opening band The Frights has a new album just released produced by FIDLAR’s Zac Carper. Also on the bill are The Beat Seakers and The Way Out. Four bands for $13. Show starts early, at 7:30. Also tonight, fabulous O’Leaver’s welcomes the cool synth-rock sound of Pleasures. The Florida band lists Battles, Flying Lotus and Tame Impala among their influences. Stephen Nichols opens. $5, 9:30 p.m.